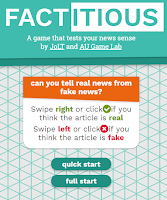 Factitious is a free-to-play current events game developed by the American University JoLT team. It connects topical issues in the news with critical information evaluation skill practice. Choose Quick Start to Jump right in and begin evaluating articles. Alternatively, select Full Start to create an account (email only, no password) to save progress. Some basic information will be asked: age, gender, education, and media savvy self-assessment. Note: email addresses with two or four character domains are not accepted. Players are given an article to read and evaluate. Articles come from genuine news and satire sites (e.g. The Onion). The name of the article's source is hidden, but can be easily seen by clicking a button at the end of the article. It may be helpful to share the "Tips for detecting fake news" page or your preferred evaluation guide with students (CARP/CRAAP, RADCAB, 5W's) to help guide the process. Players receive instant feedback for each response. The main article source is linked and described; the article's source material is also mentioned when available. Players can click the link to go directly to the originating website to verify the Factitious evaluation. As an extension to this activity, consider submitting articles for inclusion in the game.